It’s been about 41 years since Don and Marjorie Johnston began building a small trailer park across the street from the beach at Pacific City’s Cape Kiwanda. Today you’d hardly recognize the place. In 1997 Don’s son Marty and his wife Terri joined the business as partners. Gradually through sweat equity, Marty and Terri became the majority shareholders of Cape Kiwanda RV Resort & Marketplace, dramatically improving and expanding the facilities in the process. The company’s RV park, grocery store, fish market and gift store all used to share a somewhat decaying building that had originally been Pacific City Boatworks. But Marty and Terri had bigger plans. Together with Gordon Hood of GH Construction, they designed Cape Kiwanda Marketplace (pictured above) to house an upgraded grocery, fish market, deli, retail store and resort headquarters. Completed in 2005, the sprawling building also includes a large pool and spa as well as a workout room. In 2006 the old building was completely remodeled and made into Doryland Pizza, which has become an extremely popular restaurant for both locals and tourists. The 10-acre resort now includes approximately 150 RV sites, about 50 of which are leased year round. In recent years, Marty and Terri have added 14 rustic cabins built of 4-inch solid wood. They’ve also added 8 cottages with amenities that rival hotels. A clubhouse, that holds about 60, is perfect for family reunions, and available for free to resort guests. 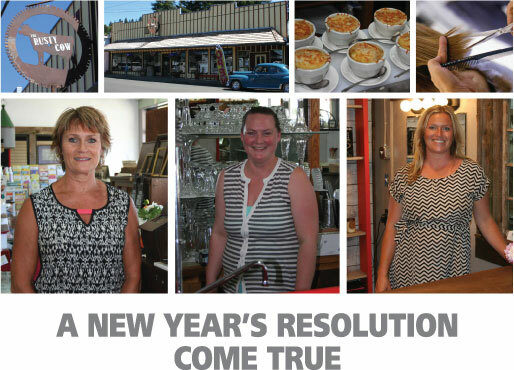 Despite the nation’s economic slowdown, business has remained strong at Cape Kiwanda RV Resort & Marketplace. The business recently completed its 41st straight year of increased sales. Apparently visitors are enjoying themselves, because more than half the company’s reservations come from return customers. In fact many Cape Kiwanda RV Resort guests choose to lengthen their stays after spending a few days. The business has also been good for the community – during peak summer months it employs a staff of 48. Marty and Terri co-chair Pacific City’s Dory Days Parade Committee. In their spare time they enjoy quads, jet skiing and boating at their solar powered home at Lake Billy Chinook. Building a business as diverse as Cape Kiwanda RV Resort and Marketplace is virtually impossible without a strong relationship with a bank, which is exactly how Marty and Terri describe their relationship with Oregon Coast Bank. “They believed in us,” explains Terri. “We feel fortunate to have a bank like that in town.” Oregon Coast Bank has provided loans, a revolving line of credit and a variety of business and personal accounts. While growing up, Marty spent his summers fishing commercially in Pacific City and calls Rose Wharton (manager of Oregon Coast Bank’s Pacific City office) a lifelong friend. “No matter what we need, Rose takes care of it… you just can’t get that kind of service at the big chain banks,” points out Marty. Perhaps the best part of working at a community bank is knowing that in a small way you’re helping your customers succeed. Through vision, persistence and a lot of hard work, Marty and Terri have done an incredible job with Cape Kiwanda RV Resort and Marketplace. We feel fortunate to be their bankers.